Last week it was tobacco and this week it's tobacco again and I have a feeling that, since winter is setting in fast, it's going to be mostly reviews of warm things and comfort scents and Orientalia for the next three months or so. Do you read News of the Weird? It updates every Sunday and it’s generally just a whole lot of fun: strange, awful, or ridiculous news stories, encapsulated and presented for your weekly amusement. That plus PostSecret are the first things I read when I fire up my computer on a Sunday morning. 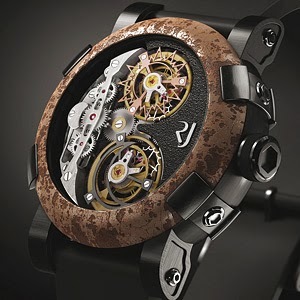 And naturally, contrarian that I am, I need to make an argument as to why a $300K watch is not worthy of ridicule. I mean I wouldn’t buy one, no matter how much money I had, and you probably wouldn’t, either. But people who could afford a $300,000 watch are not like you and me. If you were say worth more than $10 billion dollars, and over a hundred people currently are, then your perspective on what’s doable and purchasable would necessarily change. Once you’ve given away countless millions or even billions to charity and created a bunch of companies to employ tens of thousands of people and bought some houses and some cars, you’ve still got more money than you could reasonably spend in a lifetime. Maybe you take up watch-collecting. Maybe you have dozens of beautifully worked examples of the art form, and then you see this kind of ridiculous and ridiculously expensive but also strikingly beautiful watch: well, why wouldn’t you buy it if you could afford to? The thrill of the limited edition, of something that only a small number of people will be able to own, is not nothing. You could argue that anyone with that kind of money to blow on a watch has too much money. But what if it were a painting? Is there a painting out there that’s worth $300K to some collector? If you were an acclaimed sculptor whose work was in demand around the world; if you made a small, intricately detailed sculpture which was being cast in bronze, limited to nine pieces, after which the mold would be destroyed; if you thought that each of those sculptures was worth $300,000; if nine extremely wealthy art collectors agreed with you and bought those beautiful objects to own and enjoy: would anybody think there was anything wrong with that? * Naysayers might grumble that art prices are ridiculous, that some people have more money than brains, that the money could better have been used for charitable enterprises: but in the end, most people would agree that if you have the (legitimately acquired, let’s stipulate) money, then you get to buy more or less whatever you want with it. 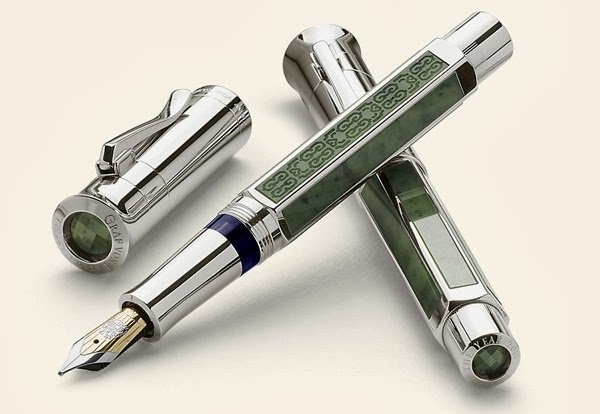 the jade-panelled Graf von Faber-Castell 2011 Pen of the Year, which I think is a profoundly beautiful piece of art. I’d use it all the time, too. It’s currently £3000, VAT included, and, if I had that kind of money, so worth it. 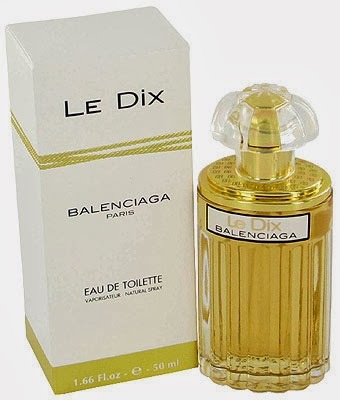 All of this is relevant to people who love perfumes, of course, because high-quality perfumes serve little practical purpose and are often expensive well beyond their actual cost to produce, but they inspire the collector’s passion and are considered by their devotees to be well worth the price. 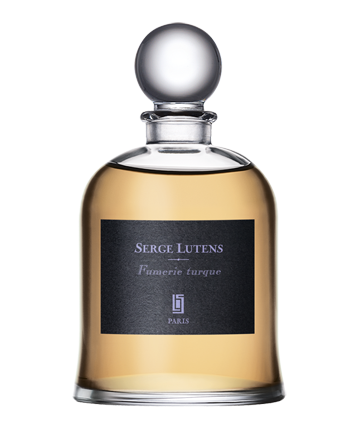 My own personal mania is for Serge Lutens scents, which I think are a form of olfactory art. I have I think thirteen full bottles of his scents, and every one of them is something I love and wear as often as I can. Three and a half years ago I was in Paris for a single day, made a pilgrimage to the Serge Lutens boutique, and, on the assumption that I would never be there again, bought two 75-mL bell jars: Fourreau Noir and Fumerie Turque**. I think I paid €125 each, which was about $175 at the time, the most I have ever spent on a scent and worth every penny: I have gotten endless pleasure from those two bottles. Fumerie Turque means "Turkish smoking-room", and unlike last week's Le Tabac, which was mostly just a pouchful of cherry tobacco, Fumerie Turque is the story of what happens when a roomful of men are smoking it. It smells not only of tobacco but of its pungent smoke; of dried fruit and of honey-and-rosewater baklava for snacking; of leather upholstery; of good clean sweat. Later on, hours and hours later, most of the smoke has drifted away, the men have left their hookah den, and Fumerie Turque smells mostly of the honey in Miel de Bois, which to my mind is an awfully good thing to smell like. 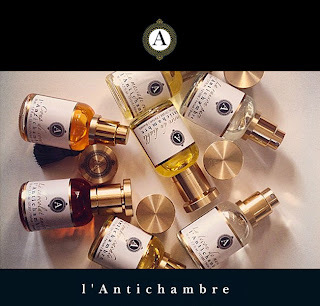 If you would like to read a completely contradictory review, you ought to head over to Kafkaesque, whose writer is one of those people who can fractionate a scent down to its precise elements and timings (I can't) and who loathes Fumerie Turque as much as I love it. And maybe you'll hate it as much as he does; it's not accessible and loveable, that's for sure. But it is astonishing and complex and wondrous, and that is good enough for me. * And, in fact, this is not far from being the case with the Spanish sculptor Miguel Berrocal, who produced a number of sculptures — some small enough to be worn on a chain around your neck — which were also fiendishly difficult puzzles, such as the Goliath sculpture seen here. You see that fig leaf covering his groin? 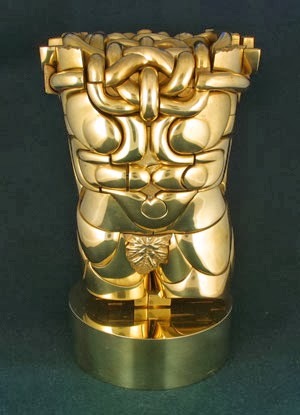 Deep inside the piece as two of its puzzles elements are buried two sets of genitalia, one circumcised and the other not, and you can assemble the sculpture (which comes with an instruction book — these puzzles are difficult) with any of the three options showing and the other two tucked away. To the best of my knowledge, none of Berrocal’s pieces ever sold for three hundred grand (and a few of them are available on eBay for between $600 and $16,500), but the principle is the same: relatively rare artwork that doubles as something else, intended for a small coterie of knowledgeable collectors. ** In truth, I didn't know at the time that Fumerie Turque was also available in the 50-mL spray bottle: it I had, I would have bought it in that format, because I like spray bottles and also because I can't quite imagine emptying a 50-mL bottle as it is and I'll definitely never use up 75 mL of anything. Mais je ne regrette rien. 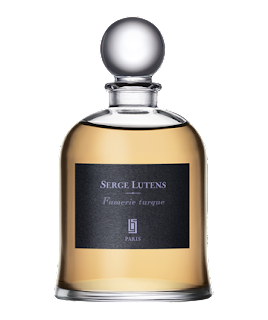 Every Lutens enthusiast should have one of these gorgeous, gorgeous bottles.